Are you getting as excited as I am about this virtual race?? I have three more prizes for you all, and I'm super excited about them. While I haven't personally tried them myself, they are definitely products I've been wanting to try for awhile, and I'm pumped to be able to include them in the list of prizes. Since I haven't personally tried these products, I reached out to some of my fellow FitFluential ambassadors, and I'll share with you their thoughts on these products. Have you heard of this? It's a sweat band that you wear on your hand! I love the concept, because it leaves your hands free, and gives you something to wick the sweat from your forehead before it drips to your eyes. Lea from Running with Ollie loved this product so much that she even wrote a limerick about it. :) Seriously, though, she's not a towel-carrying or bandana-wearing girl, so she prefers the hands-free convenience of the Handana. Sarah-Jane from Fit Betty tried this out during a variety of workouts and found it convenient, portable, and sturdy! Perfect!! Elle from Eat, Run, Sail also liked the versatility it provided during a variety of workouts, but especially she liked not having to carry tissues out on a run. Plus the Handana fit nicely over her gloves during colder weather. If you like fun, clever slogans on your running apparel, look no further than One More Mile Running. They are sure to help keep you motivated. Seriously. I don't know where they came up with some of these. Of course you can always order without the sayings. But where's the fun in that? Coco from Running with Perseverance ran into One More Mile at a race expo and loved some of the clever sayings. Ok. I'll admit it. I've never actually tried any compression gear, but I've already heard such fabulous things about Tommie Copper! One day, I'll give it a try. One day. 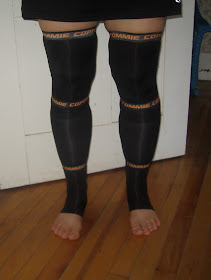 Tommie Copper is kind of unique in their compression gear because their yarn is infused with copper (hence the name). According to Julie from ROJ Running, Tommie Copper is more in the recovery market than in the wear-while-running market. Sarah from Mom Running on Empty is a firm believer after being pleasantly surprised by how good her swollen foot and ankle felt while running in a Tommie Copper ankle sleeve. Elle from Eat, Run, Sail has so many great things to say about TC! Once she had a really long moving day, and TC helped her get comfortable enough to fall asleep despite some leg cramping. She's written a ton of other reviews, too. Just do a search on her site, if you want to find more. There you have it - SEVEN FANTASTIC prizes up for grabs!! Please take a moment to drop by and give them a visit! If you missed the first four prizes, pop on over to yesterday's post. Don't forget to register! Just fill out this form. Registration ends tomorrow!! I love Tommie Copper! They are great. Another batch of awesome prizes!! !